There is nothing more magical than beginnings. Remember the anticipation and energy of the beginning of a new relationship? The rush of energy associated with the first day at a new job? The pure appreciation that accompanies the newness of spring’s first bloom? Beginnings are so alluring because they provide an opportunity to start over—an occasion to reinvent ourselves and to see the world anew. The most miraculous aspect of beginnings is that they are of our own making, even when they seem like they are divined by our calendars. For caregivers, beginnings are seemingly harder to create from the everydayness of our existence because caring for another is associated with waiting. Special rooms are named in our honor: waiting rooms. We wait for a visit. We wait for clarity. We wait for hope. We wait for information. We wait for tests and more tests. We wait for results and for the interpretation of those results. Our care seemingly exists without clear beginnings or endings, trapping us in a state of permanence, disallowing us from renewing ourselves and freeing us from the burdens of anticipating what is yet to come. Amidst the perpetual urgencies of waiting, few caregivers provide themselves the opportunity to rebel from the quicksand of waiting by reveling in the energy of creating beginnings where others only see continuity. (1) Events don’t define beginnings, we do. A quick look at your calendar of caregiver responsibilities might remind us that there is nothing so dramatic or noteworthy that seemingly necessitates a beginning. Wrong. We must define and create beginnings. All beginnings are created and manufactured. Don’t wait for your calendar to tell you what is important or worthy of necessitating appreciation. While Mondays might signal the beginning of a new work week for some, for us, it might be Saturday morning, or Friday night. To reclaim our beginnings, rewriting our calendars is an essential step in encouraging renewal. (2) Ritualize the beginning. All beginnings are marked by rituals. The first pitch of the new baseball season. The introduction of names on the first day of class. Shopping for clothes in advance of the first day on the job. When we ritualize our own beginnings, we allow ourselves to inject time as different from the countless moments that will seek to crowd it out into just another moment. How will you ritualize your beginnings? Will the first hour of your mornings be an opportunity for a new beginning—a time for reflection and awareness and appreciation? Will you dress differently? Will you sit somewhere special? Will you sip your morning coffee differently than you do the remainder of the day? Will you change your attitude leading into your moment of newness? Marking difference out of the continuity of the everyday means regaining a sense of control in how we will experience life rather than habitually deferring to what others tell us we should notice. (3) Celebrate the prospect of the beginning. The looming anticipation of a beginning is as intoxicating as the event or experience itself. Mark the event or experience sometime in the future so the anticipation can help you wade through the trivialities of the every day, but don’t place it too far into the future that its eventual reality might be placed into doubt. Scheduling a visit to a park? Planning on visiting with old friends? Beginning a journal of your everyday reflections? Marking your beginnings also means reworking your schedule so that the hours and days leading to newness allows you to prepare yourself and your senses for the experience itself. (4) Socialize the event. Beginnings are enhanced when they are socialized. Talk to your friends about your upcoming event or experience. Tell others how you are preparing for it. Ask them to participate. Post it on Facebook. Put it in your planner. Invite others. The more you talk about it, the more real it becomes. The more real your beginning becomes, the more likely you are to create a reality that both you and others respect as worthy of your attention and presence. (5) Allow the energy associated with experiencing a beginning move you long after the event itself. The energy of embracing our engineered beginnings will linger long after the experience itself. Don’t inhibit this energy. We deserve this lingering afterglow of lightness to our being because it reminds us that our self-created joy can be our greatest response to life’s limitations. Don’t be rational about it. Don’t squash excitement. Allowing our created beginnings to energize and sustain us through the challenges of the days ahead can momentarily free us so we can see ourselves and our caregiving role through different eyes. 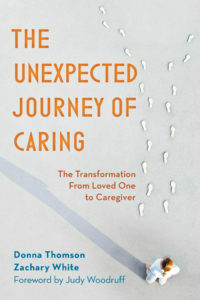 Caregivers, beginnings don’t just happen, they are created. If we allow ourselves only to be branded by others’ beginnings, we can’t help but feel trapped in an endless series of waiting and deferring and obligation. Creating the possibility of newness even in the midst of life’s most constraining moments will serve to remind us that though we must respond to life’s events, we are also capable and willing of imprinting our hours and days with our own distinct signatures.